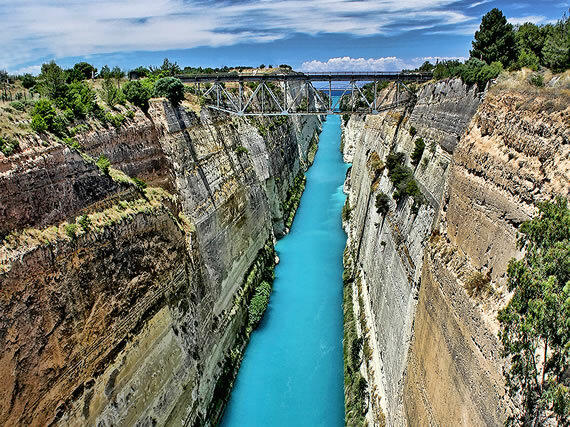 The Canal connects the Corinthian & Saronic Gulfs. Its construction started on 1882 & after hard works with many problems was completed on 1893. Its length is 6346m, its width at the surface is 24,6m & at the bottom 21,3m & its depth is between 7,5 & 8m. The side walls are of 90m high. The canal was blocked by the German forces (using explosives) on 1943 but it operated again on 1947. Today the canal is mostly used by tourist ships & private yachts. 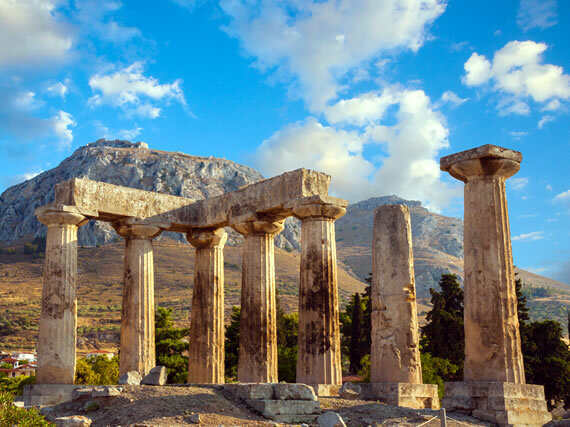 The initial temple was built in seventh century B.C. The visitor sees ruins of the Temple which was constructed in 540 B.C. The temple, which is of Doric Peripteral style, had 6 X 15 columns, pronao & opisthodomos & two cella chambers. Today only seven columns are standing. It was the Acropolis of Ancient Corinthos. It is in a monolithic rock & its height is 600m. In the highest point is the Temple of Aphrodite. Within the walls there is also the "Ano Peirene Spring". 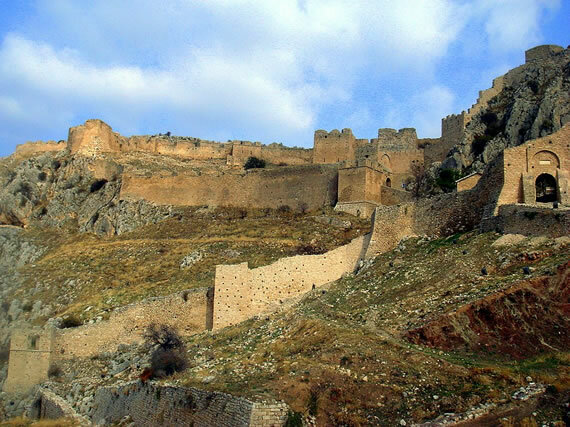 Acrocorinthos became a fortress during the Byzantine Empire. Its walls have a maladjusted form. There are three zones of fortifications with three gates leading to the interior.